Here you will find a few interesting facts about the Nottingham caves that not everybody knows. First of all, did you know that the caves were used for work places? 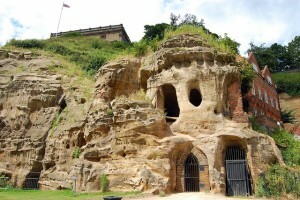 These included some medieval malt caves which were unique to Nottingham. 30 of them have been discovered so far. Each of them consisted of a smaller complex of caves which include a large germination room for the grain to be prepared, the kiln for it to be roasted and the well for reaching the local water table. The underground tanneries are quite distinctive as well with tanning pits which have been cut into the rock floors. They are all found in the caves which are along the cliffs floodplains which is adjacent to the 16th century tanneries which were mainly outside and restricted from use in the freezing winters at the time of the mini Ice Age period where temperatures were a degree lower than where they are nowadays. Metal works, monastic chapels, wagon works, ornamental follies, cisterns, butchers, cold stores, wine vaults, etc. were just some of the other uses for these caves. There are some mine groups there too from which sand has been extracted. The largest of the groups were worked by James Rouse and his colleagues for as much as twenty years in the 1800’s. There are just a handful of these caves which are still in use. The sandstone also weathers due to the breakdown of its weak clap cement. This is very important for the exposed faces and the caves open to the circulation of atmosphere, but it isn’t a problem for the caves which have been virtually sealed beneath houses or behind doors. These caves aren’t accessible since they are below private houses but there are public footpaths which lead to some of them.